The Goshen men’s tennis team lost to Marian in the first round of the Crossroads League Tournament on Tuesday. The Men traveled to Marian as the fifth seed in the Crossroads League Tournament while the Knights sat at number four. Despite playing in good form in recent weeks, the Maple Leafs were unable to avenge their early season loss to Marian. The Leafs closed out regular season play last week with a dominant 7-2 win over Crossroads League bottom-dweller Bethel College. That gave the Maple Leafs back-to-back wins to close out the season and pushtheir regular season record to 6-4 (4-4 in Crossroads League play). Goshen’s fifth seed in the tournament placed them below only the four schools they lost to in regular season play. After falling to Marian 2-7 in late August, Goshen hoped for improvement this time around and got it, but not as much as they would have liked. Goshen number one BalazsPirot, a sophomore, continued his all-around great play with a 6-4, 6-2 victory. Goshen’s number three singles player, Matt Delsar, a first-year, won his singles match and Goshen’s number three pair of Krishnan Ganesan, a senior, and Jon Kaasa, a sophomore, won their doubles match, but that was all the Leafs could muster. Marian took the rest for a 6-3 team victory. On the women’s side of things, the Lady Leafs fell in their penultimate match of the season to Purdue University Calumet. The loss dropped the women to 1-11 overall (0-8 in Crossroads League play). 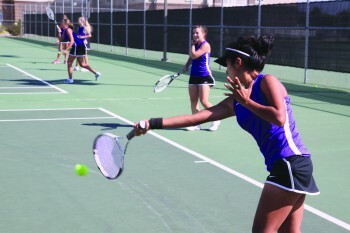 Like the men, the women lost to a score of 6-3 but found more success on the doubles side. In doubles play, the number one tandem of Anika Baumgartner, a junior, and Maria Thomas, a sophomore, lost 8-6 while their teammates Noemi Salvador, a first-year/Corine Alvarez, a senior, and Maddie Ruth, a senior/MikaylaAdamski, a sophomore picked up wins at the number two and three positions. In singles play, however, Purdue Calumet was tough across the board, with Goshen only picking up one win, by forfeit. In the second position, Noemi Salvador battled long with Calumet’s Amber Haworth before Haworth was forced to resign near the end of a long, close third set. Goshen hopes to finish the season on a high note when Adrian College visits on Friday for the final game of the regular season. Since their last win over Cornerstone University on September 6, the Lady Leafs have dropped seven straight. Another victory Friday would send them into their spring season with a much-needed confidence boost in front of a supportive home crowd.